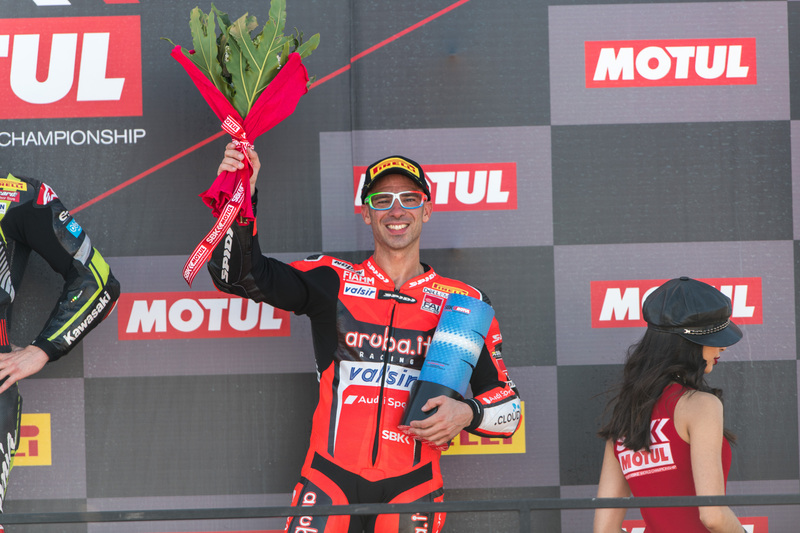 After taking second place in Race 1, the Aruba.it Racing – Ducati team stepped on the podium again with Marco Melandri in Race 2 at Villicum (Argentina), home of the twelfth round of the 2018 WorldSBK Championship. The Italian mounted a strong comeback from third row and, after a hard group fight early on that saw him drop down to ninth, he recovered ground and made several passes to finish third. Starting from fourth row, Chaz Davies got off to a strong start, climbing back up to third position, and eventually finished in fourth place, a result that helped him extend his lead in the fight for second position in the championship up to 24 points over Vd Mark. After 12 rounds, Davies (348 points) and Melandri (286 points) are respectively second and fifth in the championship. The Aruba.it Racing – Ducati team will resume action at Losail (Qatar) for the last round of the season, scheduled for October 23-25.